We’ve got a new month starting and it just so happens to be the brightest and shiniest of the year! December, aka “Christmas month”, starts tomorrow! And in just 31 days, we’ll be kicking off a brand new year! And maybe you’ve noticed that I Love Vegan is sporting a new refreshed look? Just recently I stayed up irresponsibly late and made some updates to the blog’s typography, colour scheme, logo, background, and sidebar, plus a couple of other minor changes. Did I mention that my intention was just to switch up one of the fonts on the site??? When inspiration strikes, I let it do its thing. Spurred on by I Love Vegan’s snazzy new look, I absolutely needed to add an awesomely comprehensive recipe index, right away. Now you can see every single recipe that’s on our blog (even when it’s just a wee little recipe, buried in a BIG recipe, like a vegan lunch bowl! ), listed out all on ONE page for some ridiculously easy searching. There might not be any pretty pictures, but I think you’ll love the simple usability. The Little Potato Company’s NEW Chilean Splash Creamers. 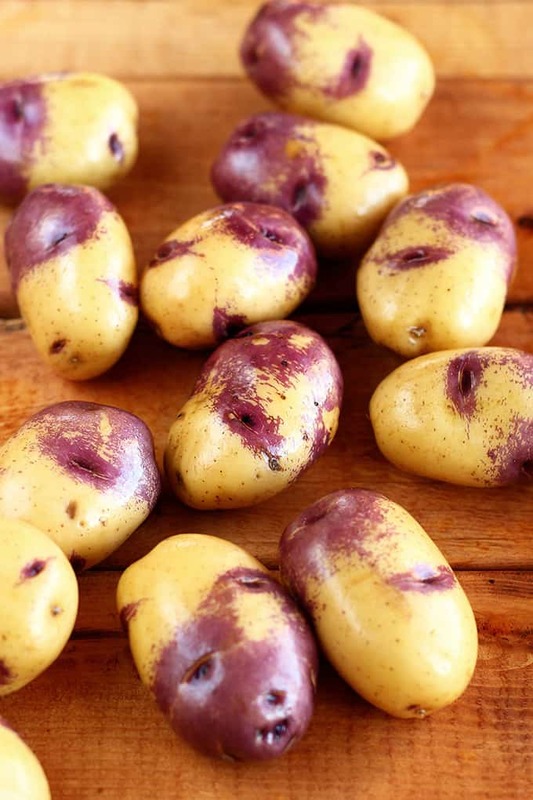 Now tell me, honestly, are these not some of the most beautiful potatoes you’ve ever seen?? bold and downright gorgeous! Seriously, get a load of that purple “splash”! pre-washed and require no peeling, just like the rest of The Little Potato Co’s Creamers. They’re also a fantastic source of fibre and potassium! Cheers for nutritious and delicious whole foods! In this recipe, I decided to let simplicity reign supreme and I let the Creamer potatoes shine. I quartered the Chilean Splash Creamers, mixed them with a splash of olive oil, dried chipotle, paprika, garlic and powder, salt and pepper, and popped them in the oven to roast to crispy perfection. 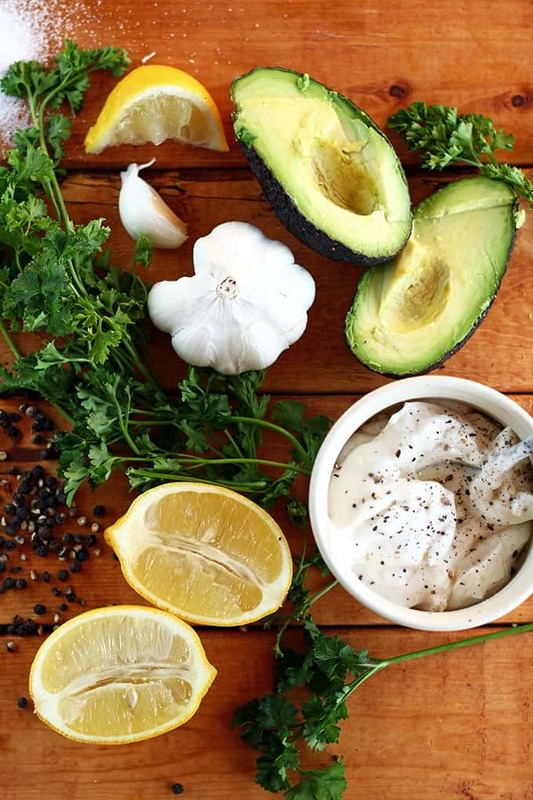 With the potatoes roasting in the oven, we can turn our attention to making the most luxuriously creamy and flavourful avocado dressing, EVER. I can now 100% promise you that crispy spicy potatoes were meant to mingle with this addictively garlicky, lemon-y creamy avocado aioli. Seriously. From now on, I’m serving it with sweet potato fries, regular fries, every type of crispy potato, all the sandwiches and veggie burgers, raw vegetables, salads, and everything else imaginable. It is THAT good. Make it and love it, ASAP! 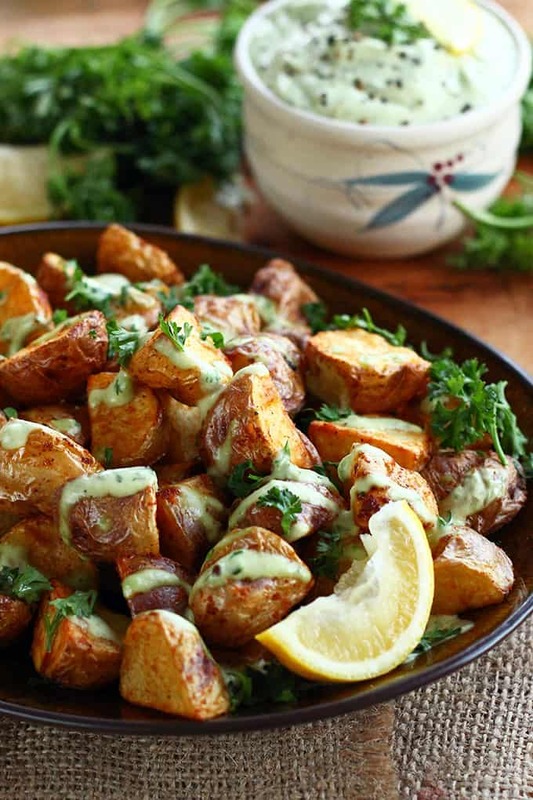 Spicy, crispy roasted Creamer potatoes drizzled with the most luxurious and addictive Lemon Garlic Avocado Aioli. Mmm! 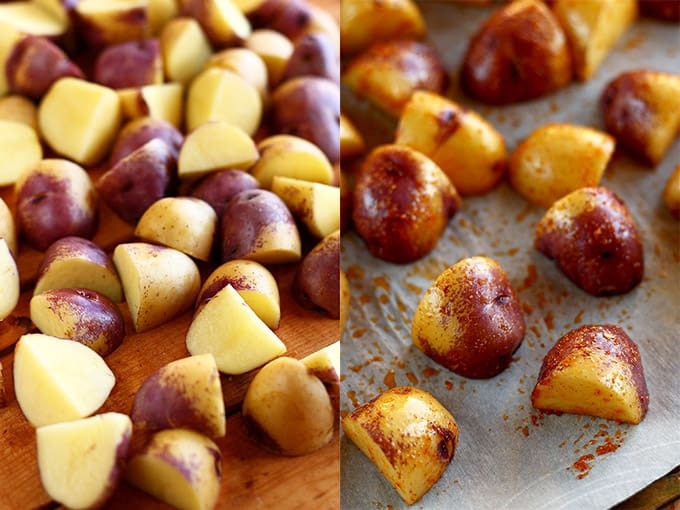 Combine potatoes with olive oil and spices. Line a baking sheet with parchment paper and spread the potatoes out, cut side down. Bake for 10-15 minutes, flip, and cook for another 10-15 minutes, or until crispy, golden-brown, and tender when poked with a fork. Optional: Add a splash of unsweetened non-dairy milk to thin to your desired consistency, from a thick dip to a thin dressing. Taste and adjust the amount of salt, pepper, and lemon juice, if needed. 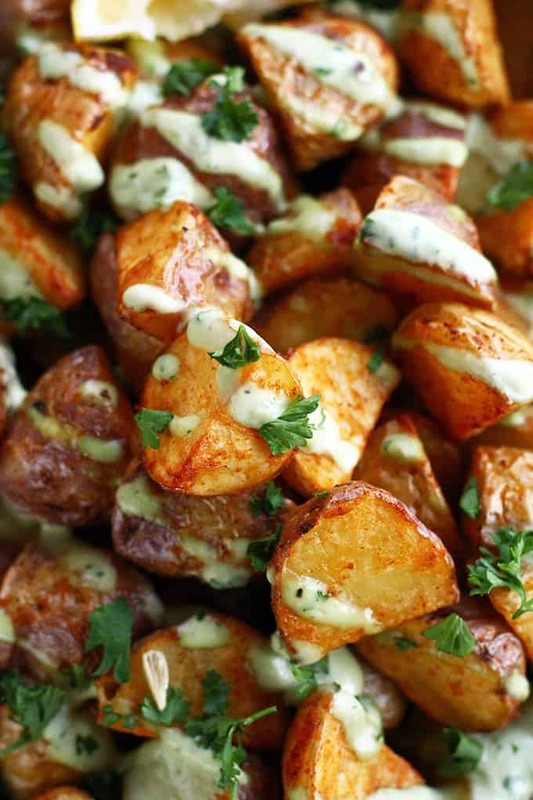 Serve potatoes plain with a side of dip, or serve drizzled with thinned dressing, and a sprinkle of fresh parsley. These just look so delicious! I love thick avocado sauces. Great food photography. Scrumptious! Whether you’re vegan or vegetarian you’re sure to love this recipe. Thanks for sharing! Pinning! This aioli sauce is soooo good! It really makes this dish and honestly any dish you put it on! I made a slight adjustment and roasted whole garlic cloves and used them in the aioli sauce. yummy! Oooh! Yes! Roasted garlic would be SO perfect here! Such a delicious dish! I loved the recipe and I’d like to second the earlier comment about this site’s stunning photos. Thank you! This looks amazing! Do you know how many days the aioli will last for in the fridge for? Due to the avocado it may discolour quickly (like guacamole or half and avocado). Top it with vegetable oil, and pour it off before using, or store it in the freezer for best results. Even if it does discolour, it will still be safe to eat for close 3-4 days.